Railways of the World The Card Game is a fast paced card game adaptation of the popular Railways of the World board game series. In Railways of the World The Card Game players use track cards and city cards to build a series of railroad routes and deliver goods! As the game progresses, players work to connect more cities, upgrade their engines for larger carrying capacity and deliver goods through a network of routes across the table. 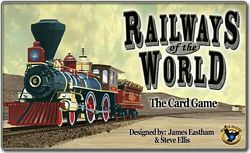 Railways of the World The Card Game provides two versions of rules: one the whole family can play, which is also a great way to introduce them to Railways of the World, and one for more experienced fans of the Railways of the World series.